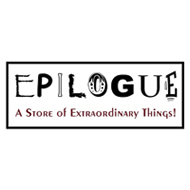 Here at Epilogue we want to provide our visitors with an unexpected and rewarding shopping, gifting and learning experience. We truly appreciate our discerning clientele and work hard to seek out wonderful and surprising high quality handmade treats by artisans from across the country. We don’t think of our customers as customers but rather as friends. We are here to be as helpful as we can, to make your day better and to evoke a smile.